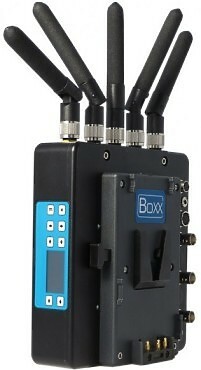 The Boxx Meridian microwave broadcast system has been designed for high quality, uncompressed, zero delay, short range HD and SD transmissions where extremely low latency is essential. It uses licence exempt channels and offers secure encrypted transmissions. It can be used for a variety of applications including large screen presentations, award ceremonies and live broadcast events. Features include: high quality uncompressed video; Zero frame latency (less than 1 millisecond); and Daisy-chain multiple receivers with seamless handover to increase coverage.